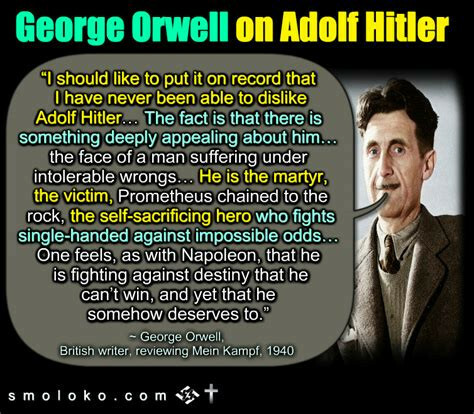 [I’m posting this review by George Orwell, who is famous for his book 1984. He is lauded throughout the English-speaking world and I heard a lot about him when I was younger. I read his book Animal Farm about communism. All in all it was good. But here is what he wrote about Mein Kampf. I am not going to go into my views on what he writes here. I will rather deal with it in a video. What is missing in here, in the British view of things, is the depth of the German viewpoint and what was driving the Germans. As always, in Britain, they twist the thinking herein. The British also, are hypocrits who attack the Germans for wanting something bigger for themselves, while the British in fact controlled the biggest empire on Earth at the time. So the British scorn the idea of a German Empire when the British themselves run the biggest empire on Earth! “It is a sign of the speed at which events are moving that Hurst and Blackett’s unexpurgated edition of Mein Kampf, published only a year ago, is edited from a pro-Hitler angle. The obvious intention of the translator’s preface and notes is to tone down the book’s ferocity and present Hitler in as kindly a light as possible. For at that date Hitler was still respectable. He had crushed the German labour movement, and for that the property-owning classes were willing to forgive him almost anything. Both Left and Right concurred in the very shallow notion that National Socialism was merely a version of Conservatism. ← Science: Do Women retain and carry living DNA from every man they’ve made love with?